Check out our youtube story on the wildlife crime scene training program! Today, as the illegal poaching of elephant, rhinos and other species continues, a ranger's job in southern Africa sadly includes being the first responder on a wildlife crime scene. The bloated carcasses from poaching activities are awful to witness. But like a murder scene, they are full of important evidence that could help put poachers behind bars. With limited resources and budgets, wildlife officials often lack the specialist equipment, skills and training, to gather and analyse crime scene evidence to be used in court to successfully prosecute poachers. This is where the New York State Department of Environmental Conservation (DEC)’s environmental crime-fighters aka Environmental Conservation Officers (ECOs) were able to help, by taking their wildlife crime investigation training and experience directly to the field. Last year, Wild Tomorrow Fund worked together with Captain Jesse Paluch and his team to create a program to both train and equip rangers from South Africa, Mozambique and eSwatini in wildlife crime scene investigation techniques. With rangers often lacking basic equipment including uniforms and boots, it was important that the program included training plus the necessary forensic evidence collection equipment for rangers to take back with them to their home reserves. This international public-private collaboration was a joint effort by Wild Tomorrow Fund, Ezemvelo KZN Wildlife, New York State DEC and the Peace Parks Foundation. 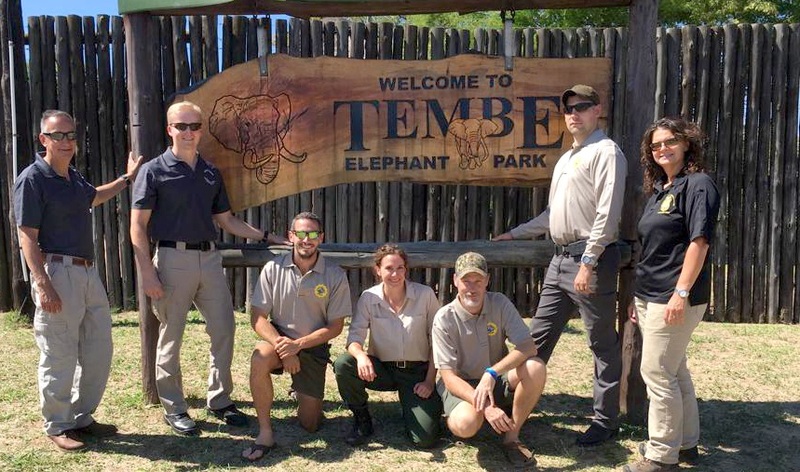 The New York State Department of Environmental Conservation team (left to right): Scott Florence, Jesse Paluch, Liza Bobseine, Ed Piwko and Karen Przyklek at Tembe Elephant Park together with Axel Hunnicutt and Clinton Wright of Wild Tomorrow Fund South Africa. In October, the team checked into their long flights at New York’s JFK airport, on route to Durban South Africa with four extra bags full of equipment supplied by Wild Tomorrow Fund. The forensic evidence kits donated to each ranger team included cameras for crime scene photography, fingerprinting equipment, rangefinders, DNA swabs, blood residue testers, gunshot residue tests and even tools to take castings of tire tracks and footprints. The five DEC Officers volunteered their time and paid their own travel expenses to conduct this well-received training. It was a very special way for these dedicated wildlife law enforcement officers to personally make a difference in a global effort to fight the illegal wildlife trade. The team spent many months in New York developing the curriculum, based on the training their investigators receive to ready them for field work here in New York State. They customized the training to suit rangers in the field in Africa, creating a practical 4-day curriculum on wildlife crime scene investigation techniques. Rangers learning how to cast footprints as crime scene evidence. The training was held at Wild Tomorrow Fund’s partner reserve, Tembe Elephant Park, a 75,000-acre government reserve run by Ezemvelo KZN Wildlife in South Africa, bordering Mozambique. In total, 16 government rangers from South Africa, Mozambique and eSwatini (formerly known as Swaziland) attended the training, working side by side, learning together and forging new relationships across borders. "KwaZulu-Natal is currently embroiled in a syndicated poaching epidemic that is testing the resources and morale of all involved. Every bit of support in the fight to protect our wildlife is another step in turning the tide. Forensic training is of great value to the staff and teams active on the front-lines, a wonderful example of inter-governmental cooperation." said Richard Schutte, Conservation Manager at Tembe Elephant Park, South Africa. The team of DEC Officers with Commissioner Basil Seggos. The Commissioner of the DEC, Basil Seggos, applauded the work of his officers, "Our ECOs employ advanced techniques in crime scene reconstruction and forensic evidence collection to uncover wildlife crimes in New York on a daily basis, and I applaud this special convoy of officers who volunteered their own time and money to travel abroad and help end the killing of endangered animals for their ivory. New York continues its vigilant enforcement efforts to stop the killing of animals for art, and this is just one more action that will help to stop illegal ivory sales." Wild Tomorrow Fund was proud to coordinate an international collaboration that enabled rangers in southern Africa and environmental law enforcement officers form New York to work together to fight the illegal wildlife trade. We are thankful for the continued commitment of New York State and the DEC in protecting threatened and endangered species around the world. We would like to acknowledge the generous support of Bayala Private Safari Lodge and Camp and the Peace Parks Foundation for sponsoring accomodation for the team, and the Bitgive Foundation for assistance raising funds for this project.